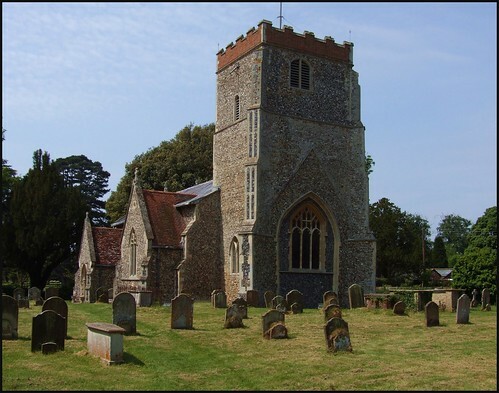 Uniquely in East Anglia, Dallinghoo church has its tower at the east end. Is this because it was built back to front? Well, no. What you see now are the remains of a cruciform church with a central tower. The chancel has gone, the transepts have gone too. So just the nave survives, with a tower at the eastern end rather than the west. This puts the porch in the right place after all, and as you step through into the body of the nave and look east, you would never notice the difference - except I do not think I could stand in that sanctuary without being conscious of the colossal weight above me. The inside is bright, neat and thoroughly Anglican. The chancel in particular is a delight. It is largely 17th century, and the Holy Table, chairs and panelling are all of a piece, even though most have been reused from elsewhere. It is probably the best Jacobean chancel in the county, and the parish are to be congratulated for making it accessible. They have done so by bolting everything down and fitting it with alarms, when it would have been so much easier just to lock the church. The communion rails are slighty later; but in any case, you will have wandered off by now to examine the amazing 17th century pulpit in the north aisle. It is the tallest in the county, and dwarfs the huge reading desk in front of it. Carved into its back is a set of royal arms. Now, you might expect them to be Jacobean, probably for Charles I or Charles II, but in fact they are older, and for Henry VIII. Almost certainly, this means that the pulpit was cobbled together using older materials. Outside in the graveyard are a number of interesting stones, including one from the late 17th Century depicting a shovel, hour glass and pick which must be by the same mason as the similar one a few miles off at Burgh. There is also a very satisfactory grinning King Death on a nearby stone of similar date. Even more striking is the lifesize statue of Hope against the north boundary. It comemorates the Walford family, who provided Rectors in the middle years of the 19th century.